Born in 1950, Lynda Hukins is self-taught; as the formal art training she desired, following her school education, was not possible. She worked for a number of years in London in hotel management before starting her own business. In 1981 the business was sold when she gave it up to have a family. Once her children were in full time education it was possible to devote sufficient and practical time to sculpting. 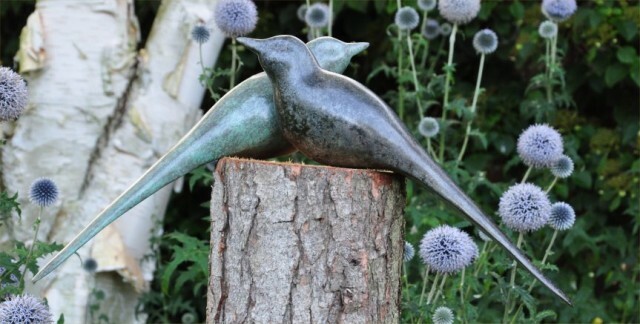 The essential nature of her early work was wildlife with the inspiration coming from the rural countryside where she lives, and the coastline. Setting out to capture the qualities of strength and movement that she looks for within her subjects, she uses a strong definition of line to draw the eye to the sculpture and give the essential movement that she seeks to give to her work. The natural environment is still a driving force for her work, however abstract pieces have now started to form part of her work in the new millennium as her style continues to develop.